Latest tweets indicate the just sent pitch 7. 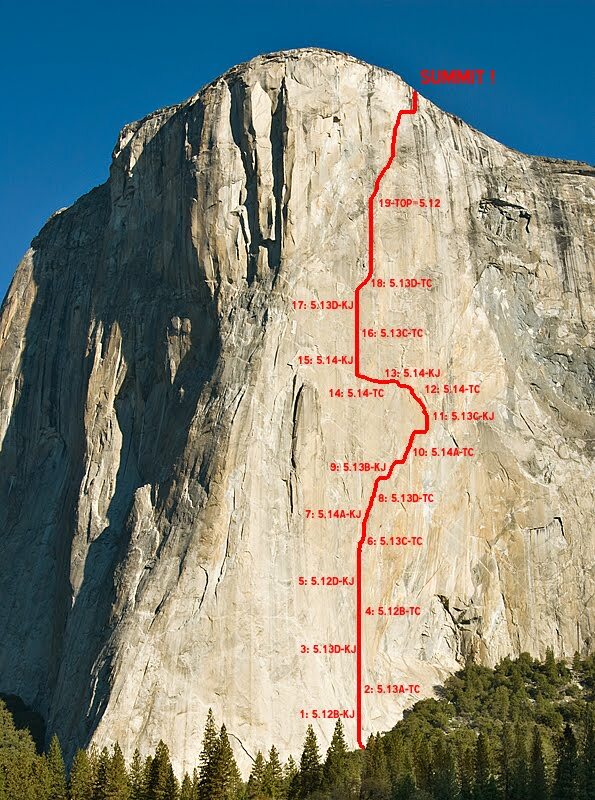 This would have to be up there for the hardest multipitch once sent and the grades listed correct? 15 out of the 19 pitches are 5.13 and above, 6 of these are 5.14! I'm pretty sure that is the line me and a mate free-climbed years ago but we didn't write it up because it wandered around a bit. >we didn't write it up because it wandered around a bit. and they even had to add some extra bolts... wimps. Maybe robertsonja could go and chop them for you. Tommy certainly didn't waste any time getting himself a new wife, after divorcing Beth Rodden. I always thought they were the perfect all American apple pie climbing couple. Apparently not. You have had your myth busted too? ... He shattered my aid climber dreams long ago! My hope is that Tommy falls in love with Kevin and that the wholesome 'becca is jailed for stealing a mirror from the Curry Company Store. I wonder if Tommy really divorced Beth? More likely the other way around. >They made it look smooth as butter from my view, though they both said it felt awkward and definitely got the heart pumping while gripping underclings with tenuous feet traversing right at the bottom. ... Doesn't sound easy to me! Still recovering from the opening salvo of the Caldwell blog. "Im looking forward to another morning of waking up next to my husband with the warm sun and a bird's-eye-view"
Excuse me. I have to lean over the rail.again. And what's with the "bit" thing. "..bit they this" and "bit they that"? Is she a Kiwi phonetic speller? You have forgotten what young love is like? Btw; I agree, it comes across as quite smitten, (i.e. too gushy for me, even if others may thrive on it!). >Still recovering from the opening salvo of the Caldwell blog. >with the warm sun and a bird's-eye-view"
>Excuse me. I have to lean over the rail.again. I think we need One Day Hero to do a new version of the Caldwell blog. I'm sure he will amp up any bedroom scenes. "A climber, his wife, and their world." OMG did we all just fall into a time vortex and its now 1952 again !? Next it will be "Mr & Mrs Tommy Caldwell's Blog"
Meh, Mr. Caldwell's private life is his own damn business, I don't care. Although, I have a strange urge to go and buy a new Sterling rope for some reason after Kevin's last tweet. There are 177 messages in this topic.